An intense three day fashion rumble. That's what went on this MAGIC Market Week when three emerging New York-based designers were invited to participate in the American Express Open Rising Stars Challenge. Aimee Kestenberg, Mary Lai and Kristine Gottilla of Spencer Devine were tasked to design a bag that communicated retro proven newness. 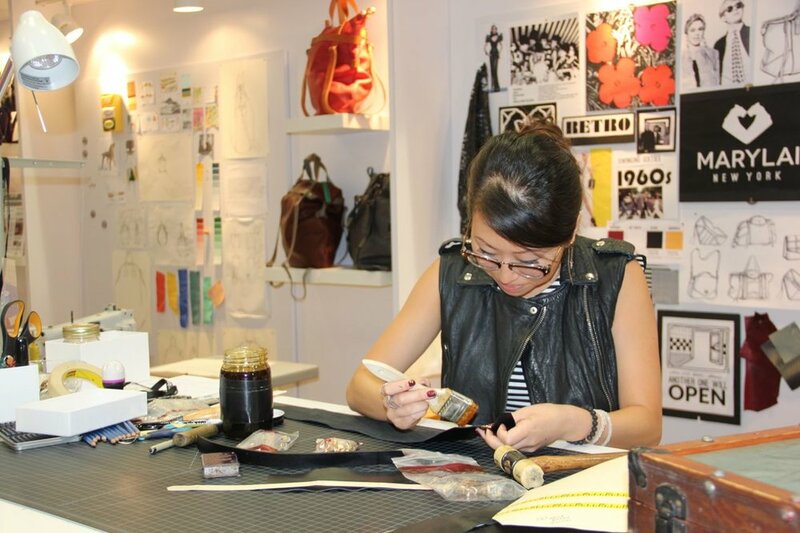 Free to interpret the brief in their own way, each designer was set up in a mini studio which included their sketches, inspiration and materials needed to create their bags during the trade show while retailers, media and influencers watched. Aimee, a talent known for crafting with Swarovski crystals, created a pop-inspired clutch with the word believe on it while Kristine, inspired by Eames, worked on a minimal tote that converted into a backpack. Mary Lai was awarded the Rising Star of Fashion for her Dita shoulder zebra print bag that was inspired by the 60s Mod movement. She told us "the overall experience was absolutely amazing. It was such a fresh idea and a new way of supporting small businesses by setting up a stage for us to shine. It was such an honor to be part of the Rising Stars and to win an event like this was truly a dream."